This is in addition to the new aquarium that they’ve been asking permission to build. But will it still be the quaint little park we know and love? Kids who bring a can of food to the Salvation Army at the Westfield Plaza Camino Mall today will get to do some indoor trick-or-treating. The event, which allows costumed kids to collect candy from various mall merchants is set for 5 to 7 p.m. Wednesday at the mall near the Highway 78/El Camino Real intersection in northern Carlsbad. And what kid wouldn’t want to trade in a can of baked beans for a bag of delicious candy? For more information call (760) 729-7927. Performers between the ages of 8 and 18 can learn some helpful tips on exactly what it takes to audition for musical theatre productions from 6 to 8 PM on November 6 or 7 Buena Vista Elementary School, 1330 Buena Vista Way, Carlsbad, but they will have to pay $35 for the opportunity. The entire audition process will be taught, along with singing and breathing techniques, acting tips and voice projection. Bring a CD or tape to use for a one-minute (16-bar) audition piece. For more information, call (760) 931-8709 or go to www.carlsbadcommunitytheatre.com. As most stage mom’s know, $35 is nothing when it means putting little Sarah on the road to stardom. Jefferson Elementary school teacher Marta Arroyo retired in 2006 after 20 years at the school, however, she has not stopped her educating ways. 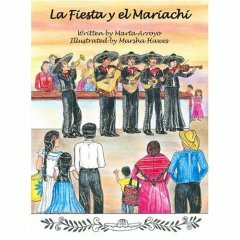 With some help from Jefferson art teacher Marsha Hawes, Arroyo has written and self-published a book titled La Fiesta y el Mariachi, according to a story in the North County Times. The 36-page book is written in both English and Spanish so everyone can read it. To get a copy of “La Fiesta y el Mariachi simply click the title. It is reported that a Camp Pendleton Marine named Kevin Sullivan, 21, crashed his automobile into a motorcycle ridden by fellow Marine Shawn Redfield, 24, according to the North County Times. The crash was reported at 10:42 p.m. at the intersection of Carlsbad Boulevard and State Street after suspect Kevin Sullivan, 21, reportedly struck a motorcycle driven by Shawn Redfield, 24, Sgt. Keith Blackburn said. . . . Redfield suffered injuries including a broken hand, facial injuries and road rash, and was taken by Mercy Air helicopter to Scripps Hospital for treatment, Blackburn said. Sullivan who not surprisingly was not hurt was booked into the Vista jail on “suspicion of felony driving under the influence.” Way to take each other out, guys. Just had a knock on the door and was greeted by two 18-year-old guys in DC hoodies. They had a couple laminated cards and they were selling something (usually magazine subscriptions) door-to-door in order to “get points to win a contest.” The prize? In this case it was apparently a trip to Cancun. One of the kids was from Georgia, the other from “Palo Alto.” If they roll by your house leave a note in the comments. For more on what this whole “teen sales crew” thing is all about, check out this story from the New York Times. 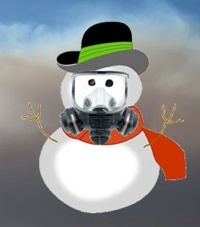 In an odd moment yesterday, I thought it might be fun to go outside with my dust mask, lie down on our ash-covered driveway, and move my arms to make a snow angel. I pondered whether the fragile ash could be formed into a snowman. Sadly, Mr. Ponte was unsuccessful in both missions. But at least Lowell hasn’t lost that wacky sense of humor. Florida-based writer Joyce Levi wrote a guest column for TCPalm.com, a Florida newspaper site, in which she recounts her recent visit to Carlsbad during Firestorm 2007. Monday morning. I awakened to a rather large, strange-looking cloud over the ocean toward the south — deep brown to gray — and I thought, “Thunderstorms today.” I quickly learned that the cloud was smoke, and there was now a “serious” fire some 30 miles east of us in Ramona and Poway. . . . Some people have left the Grand Pacific Palisades where I’m hunkered down (familiar term). The resort has opened its doors to evacuees, along with their animals, even though this is a no-pet facility. Emergencies call for new rules. Elevators here are closed due to erratic power concerns. And you know what? So do we, because Florida is about as far inland as you can get.